California Sunshine in a Jar! Send us an e-mail if you'd like to receive Dawn's monthly recipes. Just email MillicentsJams@gmail.com. Call 1-800-789-JAMS to speak with us or order! 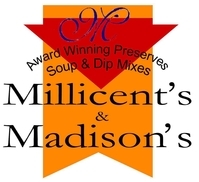 Millicent's™ Preserves & Madison's Favorites™ is proud to offer you our Award Winning Preserves, Fabulous Dip Mixes & Wonderful Home Cooked Soup Mixes. 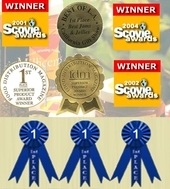 Our uncompromising approach to quality & freshness are among the reasons that Millicent's Preserves has won awards ranging from Best in L.A.; First Place at the L.A. County Fair; First Place for Specialty Food Distributors and the Scovie Awards six times! Spread the Word! Award-winning Millicent's™ Preserves & Madison's Favorites™ offer uncompromising quality and the fabulous taste of California Sunshine in a Jar. We look forward to sharing our strong tradition of excellence and innovative recipes with you. Enjoy!